You can get collateral loans in Orange County, easily and securely through Ideal Luxury. The process is simple, safe and quick, and best of all, you can walk out the same day with the money you need. We know you have many options when searching for a loan in Orange County, and at Ideal Luxury we are truly committed to the highest level of service to our customers in providing them with the loans they need. We’ve provided the ins and outs of a collateral loan, and specifically a collateral loan with Ideal Luxury below. Read it thoroughly and please contact Ideal Luxury today with any questions. We are your collateral loan solution in Orange County and beyond! Collateral loans can be a quick and easy way to obtain short-term, emergency cash when it’s needed the most. Collateral loans are, and always have been, a popular way for people in need of “ bridge financing” to receive the cash they require for any number of situations. Borrowers can be from all walks of life and income levels. One of the biggest misconceptions is that collateral loans are for the down trodden and desperate. However, that couldn’t be further from the truth. Business owners, key executives, entrepreneurs and other affluent clients use collateral loans to get the fast cash they need for payroll, supplies, expansion, taxes, startup ventures, time-sensitive transactions and more. In the simplest of terms, a collateral loan is a short term pledge of personal property in exchange for money with the promise to repay the money plus a service fee in the form of interest. A shot term loan works like this: customers pledge property as collateral and in return the pawnbroker gives them money. Once the customer pays back the loan and the accrued interest, their property is returned to them in the same condition it was pledged. If the borrower intends to redeem but needs more time a loan extension or renewal can be arranged. If the customer elects not to redeem his or her collateral, no further action is required and there are no credit consequence to the borrower however title to the property passes to the pawnbroker who can now sell the item(s). A collateral loan is commonly referred to as a bridge loan because it helps people “bridge” a gap in their finances. This short term solution is typically much easier than alternative financing and less expensive than not coming up with the necessary funds. With a reputable and licensed pawnbroker, these loans are safe, secure and beneficial. Legitimate pawnbrokers are highly regulated and governed by several federal laws that apply to other financial institutions. In addition to federal laws and regulations, most pawnbrokers are licensed and regulated by state and local authorities as well. Always make sure you are dealing with a licensed pawnbroker before entering into any loan agreement. When compared to a traditional loan, yes. You can expect to pay monthly rates that are similar to rates you would normally expect to pay annually. The fair comparison is timing and qualification; if you don’t qualify for a traditional loan, it takes too long and you don’t come up with the money you need passing up an easy short term loan can be very expensive if not disastrous. While many pawn shops will let you get a loan against almost anything (e.g. firearms, musical instruments, power tools, etc.) and as a result cater to almost anyone, Ideal Luxury only makes loans against fine watches, diamonds, jewelry and other luxury items. By specializing in only high end luxury items like these, it allows us to better relate to your circumstances, accurately value your pledged collateral and care for it properly. We approach each and every client with the same level of care and professionalism commonly associated with a luxury resort concierge. 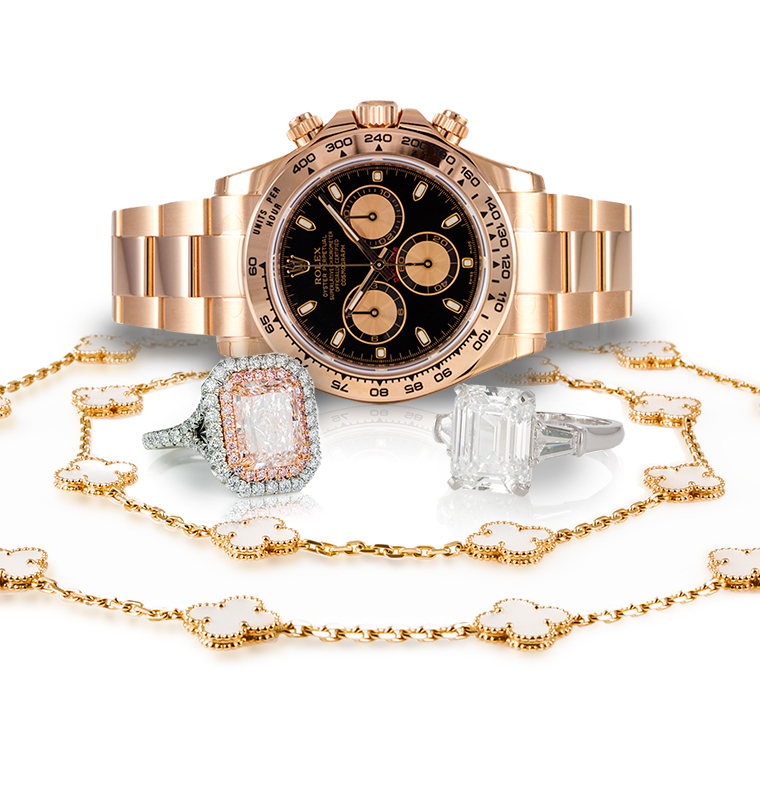 We have years of experience in the buying, selling and trading these luxury items affording us the expertise to appraise your items and get you the loan you need within one simple appointment. Our reviews tell the story, we will make the process painless. Should I just sell my items instead of borrowing against them? If you have no sentimental attachment to the items and/or you’re not sure if your need is short term or long term, yes. If the items are sentimental, irreplaceable, heirloom, etc. and/or you are confident your needs are short term then taking a loan would make more sense. Once the value of your item is established and the loan terms are agreed on by both parties, typically in 30 minutes or less, you walk out with the cash. There are absolutely no credit checks, upfront fees, closing costs or monthly payments. Simply bring in your items, sign the loan forms, take you cash and get on with your life. Ideal Luxury will make you a short term collateral loan secured by your fine watches, diamonds, jewelry or other luxury items. Our discrete, fast and convenient cash loans from $2,500 to $1,000,000 do not require a credit check, monthly payments, employment or income verification and will remain strictly confidential. Our interest rates are competitive, our terms are renewable and you can rest assured because we fully licensed with and regulated by the State of California and the Department of Justice. Best of all, Ideal Luxury meets with each client by appointment only in the comfort of a private office so there are no gates to get buzzed through or busy showrooms to encounter. If you are in need of a quick and convenient cash, set up an appointment and bring your fine watches, diamonds, jewelry and other luxury items into our private offices for a free consultation. Again, our reputation including plenty of positive reviews and testimonials speaks for itself. Helping people is what we do at Ideal Luxury and we take great pride in doing it the best!